One of the biggest differences between American automakers and the Europeans is the length of the product cycle. The original Mini lasted 40 years, even though British Leyland tried to kill it a few times. The first-generation Range Rover survived a quarter of a century. The Volvo XC90 is effectively an 11-year-old design you can buy today, and the Volkswagen Type 1 had a lifespan more reminiscent of a human's. While the engineering can arguably withstand the test of time, the styling is typically the first thing to age and in some places it shows. Take the two cars we have here, a 1962 Volkswagen and a 1966 Volvo. Both cars were available when rocket themes flooded American roads and yet they look like smaller versions cars from a previous decade. Maybe they looked dated in the '60s, but you can hardly tell today. Side by side, they both look pretty good. So which one would you get? 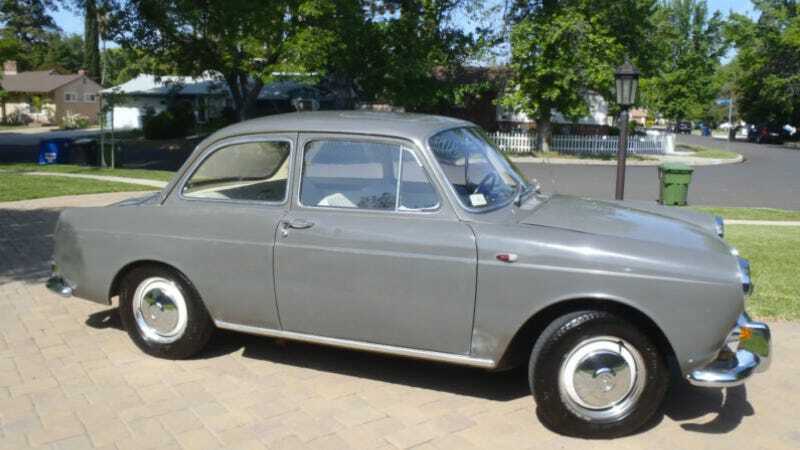 This '62 VW 1500 Notchback is a seriously interesting thing. While Squarebacks are not completely uncommon even today, it's a little tough at first glance to realize this car is a close relative of that car. Maybe it's the three-box shape that makes it look older than it really is, or the fact it was around the same time Chevrolet was touting the more futuristic-looking Corvair. Whatever your take, I think it looks awesome. This particular Notchback has traveled around, its seller saying it was originally a Canadian car that made its way to Illinois, then Florida and now California. As a very young Dustin Hoffman concluded, your VW dealer can show you where the engine is, but it's a 1.5 flat four related to that one in the Type 1. The 1950s American themes continue on the inside with the two-tone upholstery, but it's beautifully unrestored and it looks fantastic. Even at 9 grand, I really like this car. I also have a really big soft spot for Volvo Amazons. It doesn't even have to be a wagon version, but these were some of the last Volvos to have curves before the late-'90s when those Swedes stopped using only a straight edge to design a new model. And of course, being an old Volvo it's built like a brick – even if it isn't shaped like one yet. Yeah, I also really like this '66 Volvo 122S. What this Volvo really has going for it is that it's a one-owner California car, no doubt owned by a Berkeley professor for 40-something years. I'd rock that look. The green interior is pretty awesome, too. The originality here (minus a Circuit City-sourced radio) is impressive. OK, this is an autobox which I'd normally detest were it not for it sounding rarer than it probably is and the fact it's a Volvo four-door and rowing your own gears isn't going to make the driving experience much more fun – just a little quicker. It's a Volvo with a 1.8-liter four, you're not going anywhere too quickly. At less than $8,000, the Volvo is expensive but a good deal cheaper than the VW. It's a really nice car and I'd love to own it. But the obscurity of the 1500 Notchback makes it the winner for me and I'd happily find out where the engine is.